Published by Cleveland State University. $15.95, 83 pages. 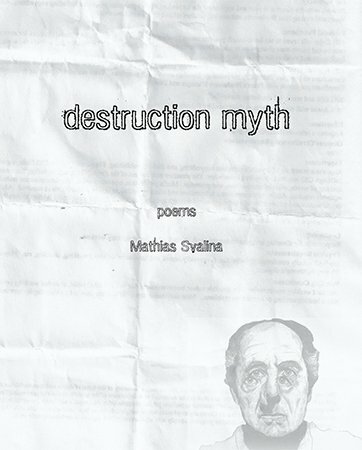 The first forty-four of the poems in Mathias Svalina’s Destruction Myth are called “Creation Myth”—that’s all of them except the very last one, which happens to be the title poem. It would be easy enough, and also probably correct, to read deeply into the title, locate there the thematic and/or philosophical and/or theoretical matrix that centers and informs the work. One could go off on the whole thing about how all creation is in some sense a destructive act (even ex nihilo creation requires a rending of the nothingness that exists prior to thingness), or, better still, how even as creation is ongoing and ever-renewing, we can never escape the essential fact of destruction: the limitless variety of creation, for all its glory, can never not be overshadowed by the singular fact of destruction, the final and re-unifying change that awaits us all. But to be perfectly honest, I’d rather not get into it, because there are few things duller than diligent, well-intentioned exegesis, and a book as big-hearted and bonkers as this one deserves better. The poems in Destruction Myth are as lucid as they are loopy, and though they run the range, content-wise, from the meditative to the downright goofy, the over-arching mood is one of infectious geniality. Svalina may be taking some formal and /or theoretical cues from Jack Spicer’s notions of dictation and the serial poem, but his attitude (though not his style) feels more in line with up-beat freewheelers like Frank O’Hara and Tony Towle. But don’t get the impression that the book is in flight from seriousness. Svalina is more than capable of gravity (cf. “In the beginning the only job was unwrapping the mummy”, and the title poem for just two of the finest examples), it’s rather solemnity which he rejects altogether—and why not? The palpable sense of this poet’s pleasure in his work is one of its most fundamental elements, and enlivens the entire experience. It is as if this book were an atmosphere with slightly more oxygen—and far less pollution—than the one we’re otherwise resigned to. Hey buddy, thanks for the fresh air! Svalina’s poems delight in delighting their reader—with surreal images, sharp turns, sudden outbursts of affect that undermine our quickly-established expectation that if one joke is told, another must follow. Some of the best poems do their good works simply by offering up some ludicrous premise (“In the beginning there was a woman with a toolbox full of paperclips”) and then keeping a perfectly straight face while patiently working the notion through to its (il)logical end. Surprises abound, and thrills. Because part of being a genial host is being a generous one, it’s hard to complain that there are forty-four “Creation Myths” where, say, thirty might well have sufficed. The main risk Svalina runs is that, having created all the conditions for propulsive readability (which is desirable) individual myths may blur together (which is not desirable) like so much scenery on a scenic drive. This concern in mind, I point you to my own two favorite creation myths, so you take care not to breeze past them: “In the beginning everything I said exploded” (pg. 17) and “In the beginning I was a little thing in the center of a star” (pg. 35)–also, “Destruction Myth” itself, though there’s approximately zilch chance of that one slipping past. In any case, it’s a sad day for poetry when stoking a reader’s eagerness to consume the work is counted as a mark against it, and the fact of the matter is that anything you miss on the first go-round will still be there when you come back and come back again, which I expect that most readers will. Unless the world ends, of course. Or unless—no less frightening and heartening a prospect—it is junked only to be remade from scratch, again and again and again.